If you think these quotes are funny, watch John play them out in Life With Derek! Check out my TV Listings page for a schedule! George: I can use some help Edwin. Edwin: You know there's this thing called child labor laws. George: I know I'm a lawyer remember? George: I Don't Need A Contractor, I Need My Son. Edwin: Great! I'll Go Get Derek. George: Not That Son, My Other Son. Edwin: I Have Another Brother? George: I Was Told There Would Be No Math. George: You know, they say riboflavin is good for you. But seriously, what is it? George: What is this behind me? Is this like a big PILLOW or WHAT? George: ...Oh and you've got a punk friend? I'm down with that! Marti: Nothing because dogs can't talk. Nora: Georgie, you can't live in denial. George: Yes I can and you can't stop me! George: Nothing contributes more to society then the modern thong but the thong must come off the wall. George: I am not faking Nora, and it would be rude to spread my germs to the Albies! Edwin:Yeah, he built a whole house once! George: *holding a birdhouse* Pretty sweet huh! The birds will be fighting to move in! George: We're a family and a family that eats together..
George: Nora this is great! You should teach me how to make this! George: Isn't there some sort of statute of limitations on that sort of hi-jinx? Lizzie: We're behind you 100%. Edwin: Because you increased our allowances 100%. Casey: Mom you have been working since before I was born is'nt this a little sudden? Nora:Well I married George on a whim, and look how that turned out! George: We get the paper? This is great! *kidding*- All I need is my slippers! Casey: Shes acting like a mom from the 50s, like when you were a kid. George: I was a kid in the 70s but go on. Edwin: Please dad don't make me, I'm not a do-gooder type! George: Well people change Ed, especially when they have no choice. Casey: I was chosen to make a movie about our blended family for sociology, about thow things have been with Mcdonalds and Venturis after a year of living together. Nora: Aw, thats so wonderful. Casey: Yeah it is, my film will suggest that if two very different familys can live together in harmony, the world can do the same. George: And filming me in my underwear is going to prove this? Nora: Wait this is going to be scene my your whole class? Nora: Well I'm going to get dressed and put on my make-up like I always do before breakfeast. George: Me to, me to, I mean the get dressed part, not the make-up! George: I DO NOT WEAR MAKE-UP! Casey: And George how do you feel about our merged family? Casey: George can you just say that to the camera? Casey: How did you two meet? George: Oh, well how dose any couple meet? George: Of course I remember, at the frozen food section at the super-market! Casey: I didn't know thats how you two met! Nora: Beacuse it isn't thats how you met your first wife ABBY! George: Hickory dickory dock The mouse ran up the clock! George: Has anyone scene my briefs? Nora: Check the basket in the laundry room. George: Not my underpants briefs my legal briefs, major trial on monday. Nora: Ya I know check the basket in the laundry room, honey. George: Nora was right the report was in the laundry basket, did I miss dinner? Edwin: Nora's ordering it now. Edwin: We haven't disscussed the benfits package. Edwin, Yes, chore reduction, bedtime extendature. George; Thats not even a word, is it? George: Cookies is a word. George: Derek mellow, Valentines Day is weeks away, you have time to save. Derek: Ya, maybe in the world where people still say mellow, but in this one its in 2 days. George: Dibs on the mits! Derek: I saw it first! George: Come on Derek! Come on! Listen! This is my first Valentines Day married to Nora its gotta be PERFECT! Derek: Well she married you, obviously her standards aren't that high,Get her some flowers. George: Flowers? Everybody gives flowers, I, I need something orginal. Derek: Ya when you find that something pick 1 up for me. Casey: Hey, successful Valentines Day shopping? George: Oh ya, look, I got myself some new pants. Casey: So what'd you buy for mom? George: Nothing, I talked to Nora and she said shes not into all that commerical romance stuff, so I'm off the hook. George: Haha! Look at this! Derek: Thanks for the advice Dad! George: Your welcome, Hey check it out I found it! The perfect Valentines Day gift for Nora. George: Yeah, yeah beacuse it represents the blending of our 2 familes. Derek: Not unless you want your first Valentines day with Nora to be your last. Casey: And don't you dare break up with her! Nora: Asking me to a school dance, how sweet are you? Nora: And it was really sweet of you to cancel your big plans for Vanetines day so we can shaporn the school dance. George: Anything for the children. George: I can't hear you with my mouth full! George: Oh, it was so cold in that arena, I just thought my toes were gonna fall off. You know once saw this documentary of these guys climbing Mount Everest, their toes turned black from frost bite, they had to cut'em off. One of the Everest climbers, he kept his baby toe on his mantel as a memento! George: (Reading from a cookbook) Add hot pepper flakes for taste. (samples it, coughs) Perfect! Nora: Ooh, something smells good! Nora: Oh, make sure its not to spicy, for the kids. Nora: No thanks, uh George can we talk about something? George: Not now honey, its a genius at work! (laughs) (drops book in chili) Whoops! You didnt see that! Nora: Oh, I wish I had'nt! Nora: George shounld'nt you be on the road? Dereks hockey tornament is an hour away. George: Just in the middle of something here. (hand is cearal box) Where's that prize? (To Edwin)-What were you doing outside? Nora: Is that the same shirt you were wearing yesterday? Edwin: Of course its my lucky shirt, sweet the prize is still there! George: I had my hand in there all morning! Edwin: It's the lucky shirt. Nora: Edwin, its not healty to wear the same shirt everyday, maybe you have a cleaner, luckier shirt in your draw. Edwin: I can't change now, Dereks team is on a winning steak, if I change now and we lose he'll freak! George: Makes sense to me. Npra: Will you explain that to me? George: Oh come on boys will be boys right? Derek: It looks like a retirement home! George: My couch, where is it? Edwin: Somebody stole our couch! Nora: No honey, we had it taken away. Lizzie: For only 20 bucks! Edwin: But there was 40 bucks of change in the cushion! George: I loved that couch! George: It was'nt old it has history! Its been in the family since I was a teenager, I had my first kiss on that couch! Edwin: And I was going to have my first kiss on there! George: And what happen to our televison? Derek: Tell me you didnt give away our televison! Casey: No, we moved it to the basment. Derek: Why would you move our most prized possesion to the basement? Lizzie: We can still watch it, we just have to go downstairs. Nora: I know its not ideal, but it was such an eye sore. George: It was a thing of beauty! Casey: Who said you could eat on our new couch? Derek: Uh couches are made for eating and watching sports. Nora: Not this one it was expensive. George: Oh see this just goes to the imprudence of the purchase. Ok the old couch was perfect for eating... how expensive exacly? George: 3, you, 3 you spent 3 thousand dollars on a couch without telling me? Casey: Why would she have to tell you this isn't the stone age. Nora: No, its ok Casey. Why would I have to tell you this is'nt the stone age! And I make my own money! George: Derek please, and I don't? Nora: No, yes, I mean but you hate furniture shopping and Casey thought we should suprise you. Derek: Oh, so this was your idea I should've gussed. George: Nora you know what your cramping my style! George: And Derek he rightly pointed out that your just trying to brainwash us! George: 3 thousand is just to much to pay for a couch, you could put whels on it and drive it! George: (walks in the door) My couch! (jumps on couch) Oh yeah! Thats the stuff! Nora: (walks in) Is that your couch? George: Dont look at me I had nothing to do with it! George: I am not a prankster, its just a little hobby I had in high school, law school, university and now sometimes work. George: Hey Nora, so that was uh your sister she's uh coming to stay with is this Friday. George: Yeah, she says she needed a brake from Harry. Nora: A brake!?!?!?!?! We just threw them a wedding 3 months ago! George why didn't you let me talk to her? George: Because, because I'm kidding, she called to invite us for dinner next week. Nora: George that's not funny! George: Get a sense of humor! Principal Lasater: Mr.Venturi, glad you can come in today. George: (Still shaking the principles hand) Its my pleasure, I mean not that this is a pleasure believe me I'm not happy to meet you, under these circumstances, under normal circumstances maybe we can hang out or maybe, maybe even go bowling? George: Um, Mr.Lasater, can I call you Fred? Principal Lasater: My name is Frank, but Mr. Laseter to you! George: Hear that! So from now on you dont walk, talk or breath unless I say so! Derek: Can I breath now? George: Yes then go to your room! George: Nora, do you know where Derek is? You know what, you know what he just did? He just used the garage door as a hockey net, you know so now hes gonna add painting to his list of things to do. Nora: Uh... George, Marti borrowed that robot from Dimmy without his permission. George: Really? Hey Marti, come on out here, you got to take this right back right away and give it baack to Dimmy before he relizes its gone, ok? Nora: Uhh no ok you dont got it and apparently you dont either, borrowing something without permission is stealing. George: Yeah actually, actually munchkin it is. So why dont'cha start by taking this toy back to Dimmy and apologize. George: Marti, you tell me what a lie is. Marti: Something that grown-ups get to do. George: Marti, nobody gets to lie. Marti: Then how come you told Nora someone scratched the car when you scratched the car on the parking meter? Marti: and when you said you'd clean out the garage and you had a nap. George: Well ok fine, fine sometimes a grown-up dose get to tell a lie beacuse its just the way it is but kids cant end of story. Marti: Daddy thats not true! George: Ooook so you do know what a lie is, you see good, good beacuse I was just testing you there, ok I wasnt testing you but I wont tell any more lies to Nora or to you or to anyone ok? Nora: Ok, now remember stick with the group and lots of sunscreen. George: And no dropping water balloons from the balcony. Edwin: Dad, please, I'm strickly there to learn about Canada's government system. 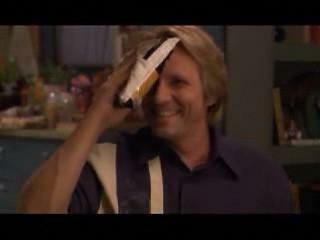 Casey: Oww! Ow not so hard! George: Sorry, the only long hair I ever brushed was on a horse, got kicked in to. George: Where are your pictures Edwin? Edwin: Oh, their not so great. George: Their right here? Lets have a look. (Looking at pics) Is this some new art exhibit? It looks kinda like a toilet seat cover. Edwin: Uh yeah it is a toilet seat. George: Lamp, pillow, bed did you even get out of the hotel room? Edwin: Dose the ice machine count? Nora: What happen to much sun? Lizzie: More like something he ate. George: What did you eat Edwin? Edwin: My halloween stash and a room service sundae. George: I know Aunt Madge is a bit odd. Nora: No honey, I'm talking about the weather, its getting worse and worse. George: Just looks bad from the window, I'll check outside. (Opens Door, snow comes flying in) Holy macaroni!!! George: We can make a fancy dinner just for 2 beacuse who needs turkey when you can have quail! George: (answering door) Aunt madge? Aunt Madge: Oh, you still havent got a haircut George! Aunt Madge: Usually I visit Georges brother in Winnipeg, but he is so boring! George: (Walking inside with sticks) Ok! We're going to build a christmas tree! Edwin: Dad, why would we build a tree when we could buy a perfectly good fake one in the store? George: Ed, beacuse this is way more fun, and stores are closed. Nora: A hole in the roof? George: Wait wait, hang on when did that happen? Edwin: Maybe a couple weeks ago. Nora: Why didnt you tell us sooner? Edwin: Beacuse I didnt want to lose my sweet atic bacholer pad. George: I'll go take a look, see what I can rig up to keep the rain out. Derek: Oh, oh your not going on a ladder! Edwin: And not using a hammer. Casey: Hammer? No, no hammers are loud, buckets are good untill tomorrow. George: No, thats an easy job. Wheres my tool belt, beacuse I have to protect my family from the elements! Casey: Come on George is shivelrous, hes not exactly handy but hes trying to fix the roof. Nora: Oh, great honey. Uh look I'll call the contractor in the morning and he can finish the job. George: Dont bother cause I'm gonna fix that myself. Save us some dough and I get to use my cocking gun! Casey: Derek! He dirves me crazy! George: At least he has a licence to drive you there! Edwin: I found Nora's weekend schedule on the floor. George: You couldnt have because I have Nora's driving schedule right here. Edwin: That is the driving schedule but this is the house to-do list. George: Theres stuff to do in the house? Edwin: What do you think it took care of itself? George: No, I just kinda hoped. Joy Tanner (Nora): John Ralston is probably the oddest cat in the cast. Joy Tanner (Nora): And sometimes what he dose, he just cracks himself up, he just starts to laugh and we're not quite sure what hes laughing about and then it just gets everyone going and then it ruins the shot but it dosent it makes things alot more fun. Ashley Leggat (Casey): John dose some really werid accents, and what not. Mike Seater (Derek): John, he has all these jokes that he just repeats, once he finds something funny it never ends. John: Who knew you could order peas and wear them at the same time? John: What're ya doin' lad, huh? Come over here, what're ya' doin'? Explain that to me, would ya? Ya' havin' another hot chocolate? Uck lad. Uck ay...People should NEVER do Scottish accents. Should never attempt it. John: I would wanna be Casey beacuse I just want to dance! Thats what I want to do, I just want to dance! John: I would want to be Ashley beacuse I just want to dance. Ashleys a very good dancer, I'm not. Ariel: The last time I ate ham was 39 days ago. There have been 120063 visitors (325899 hits) on this site!